Fields of Blood: A New Warriors of Chaos? The drums have been beating quite loudly over the past week that the November release will be an update to "Warriors of Chaos". The expectation is that this means a new book - and certainly that would be the preferred option for the Fantasy base - but GW surprised with the Daemons update. With so much time being expended on 40k and with The Hobbit to hit before year end, you can't rule out another White Dwarf fix-it. My own feelings are that I'd be surprised if it is anything less than a full book. Though not to the same extent as with 40k, Chaos mortals are a key tenet of the Warhammer lore. A reason to take Marks other than Tzeentch. Yes, you see some Marauders and Warriors marked Khorne and Marauder Horse marked Slaanesh but Tzeentch is the predominant Mark. A fix for Forsaken. A skirmisher troop type is a great idea and certainly in keeping with the fluff, however the Forsaken are probably the unit least seen in the whole of Warhammer Fantasy (even Razordons get more love). The Eye of the Gods table needs to be fixed - not the concept but the mechanics. How often before a game do you hear "You go and get a coffee while I work out what my Chosen are". Two Warshrines. The Chaos Rare needs some love. Upgrade the Shaggoth or introduced a new monster. Chaos Rare at the moment is 2x Warshrines (usually marked Tzeentch) or two Hellcannons if the comp lets you. Chaos seem to be poster boys for the SPCA, they are the only people concerned when their dogs die. Animal lovers yes, but I question the need for a Panic Check. The one thing I'd hate to see removed is the Infernal puppet. I think it is a great part of the list and a fantastic leveller in the magic stakes. Hope it is perservered with. So what do you want to see with Chaos? I have a Chaos warriors army and what I'd like to see; Chaos warriors moved to Special Choice, stackable ward saves removed and puppet removed. That would balance the army no end. I like dragon ogres - Keep them, they should be the armys Monstrous cav unit. 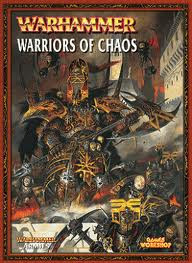 Chaos warriors are the CORE of the army, they must stay in core. Make Daemon princes actually worth taking. I think they will change the marks to a model payment basis, not a 30pt or whatever unit upgrade. Chaos Warriors need to be nerfed if they stay in core. As is they're fine moving to special. The puppet is undercosted as is and needs removed or point correctly. Marauders are too cheap and stackable ward saves are broken. 1 - Fix Mark of Nurgle - it is is terrible. 2 - Work the book in such a way players can play a themed army. For example if one wanted to play a full Khorne army without magic then give them some nice magic defence. 3 - Maybe some bonus for mono mark armies? Assuming a mono theme is not OP to start with. They're sorcerers, I agree with ld8. If you gonna add harpies, might as well ad beasts and daemons as well...oh wait, that's 6th edition and previous. New Hvy Cav - Knights on Juggernuats! Shaggoth needs a buff or ditch it. Chaos Dragon alternative, make a single headed dragon @ 300/320, and slight stat downgrade. Harpies or some other type of flying skirmish unit. Maybe Heavy Cav - but should be god specific. if chaos marauders are inspired by nomadic tribes like huns and mongols then why don't they have any option for bow or some other missile units. Its rather boring when an army can't compete in one whole phase of the game.